The New York City mayoral election of 1993 occurred on Tuesday, November 2, 1993, with Republican nominee U.S. Attorney for the Southern District of New York Rudolph Giuliani narrowly defeating incumbent Democratic mayor David Dinkins. They also faced several third-party candidates. The election was a re-match between the same two candidates from 1989, when Dinkins had narrowly defeated Giuliani to win the mayoralty. It's the street tax paid to drunks and panhandlers. It's the squeegee men shaking down the motorist waiting at a light. It's the trash storms, the swirling mass of garbage left by peddlers and panhandlers, and open-air drug bazaars on unclean streets. Dinkins and Giuliani never debated during the campaign, unable to agree on how to approach a debate. Jimmy McMillan, the founder of the Rent Is Too Damn High Party, made his first run for political office in this election. In the course of his campaign, McMillan was at one point tied to a tree and doused with gasoline; he would later climb the Brooklyn Bridge and refuse to come down from it unless television stations broadcast his message. He was ultimately disqualified from the ballot for coming 300 petition signatures short of the 7,500 needed to qualify for the general election ballot. Dinkins was endorsed by The New York Times and Newsday, while Giuliani was endorsed by the New York Post and, in a key switch from 1989, the New York Daily News. Dinkins earned 48.3 percent of the vote, down from 51 percent in 1989. Although he was a moderate with a substantial history of building coalitions and supporting Jewish causes, one factor in Dinkins' loss was his perceived indifference to the plight of the Jewish community during the Crown Heights riot. Another was a strong turnout for Giuliani in Staten Island; a referendum on Staten Island's secession from New York City was placed on the ballot that year by Governor Mario Cuomo and the New York State Legislature. Dinkins defeated Giuliani handily in Manhattan, Brooklyn, and the Bronx, but Giuliani's margin in the other two boroughs was large enough to win the election. Giuliani won by a margin of 53,367 votes. He became the first Republican elected Mayor of New York City since John Lindsay in 1965. ^ a b Purdum, Todd S. (November 3, 1993). "Giuliani ousts Dinkins by a thin margin ..." The New York Times. 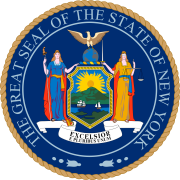 ^ New York State Department of Labor statistics, "Workforce industry data". Archived from the original on October 19, 2005. Retrieved November 18, 2006. Gary M. Klass, Just Plain Data Analysis: Finding, Presenting, and Interpreting Social Science Data (2d ed. ), pp. 52–53. Randol Contreras, The Stickup Kids, Race, Drugs, Violence, and the American Dream (University of California Press, 2012), p. 110. ^ John H. Mollenkopf, A Phoenix in the Ashes: The Rise and Fall of the Koch Coalition in New York City Politics (Princeton University Press, 1994), p. 218 (Afterword). ^ Katharine Q. Seeley "In G.O.P. Debate Today, Which Tack for Giuliani? ", The New York Times, May 3, 2007. Accessed March 31, 2008. ^ Parente, Michele (1993-06-25). "A Political Attack? Would-be mayor tied to tree." New York Newsday. ^ Raftery, Tom and Miguel Garcilazo (1993-10-27). OWNER OF THE FLYEST HAIR ON EARTH "'Rambo' jams up B'klyn Bridge." New York Daily News. ^ "Archives Main Page". Blackpressusa.com. November 11, 1989. Archived from the original on September 21, 2011. Retrieved September 23, 2011. ^ "Elected Mayors of New York City". NYC.gov. Archived from the original on October 12, 2007. Retrieved October 26, 2007.